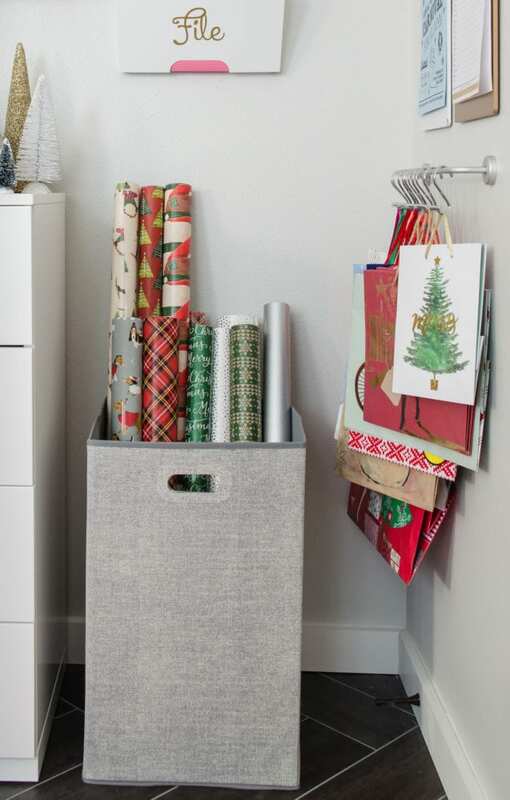 Gift wrap storage can be a struggle. We’ve kept wrapping supplies a variety of ways, but could never easily find what we were looking for. Until now! I’ve heard that some people have full gift-wrapping rooms in their homes. While I could understand thinking that is ridiculous, I find it a bit dreamy! Back in reality, we’re not planning an addition to the house for gift wrap storage anytime soon and I’m going to guess you aren’t either. Today, I’ve got a solution to get the same effect in less space! 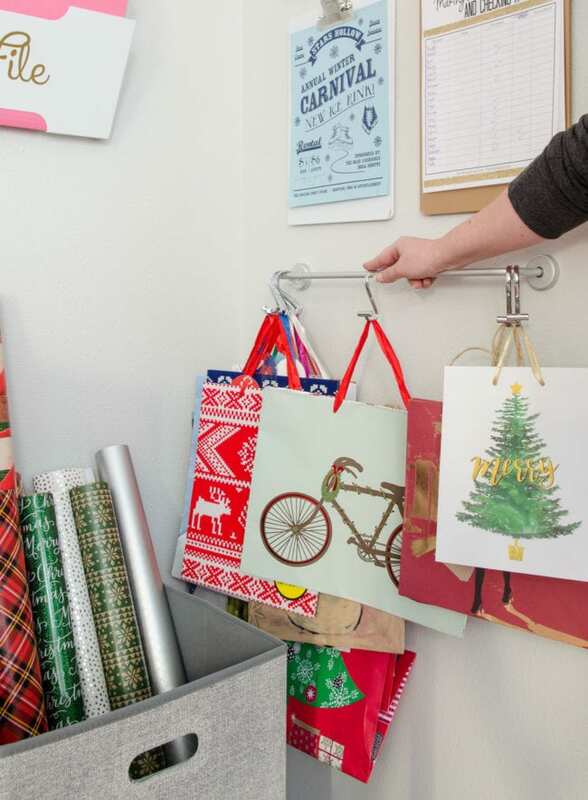 My friends at Interdesign asked me to use their products to organize my wrapping supplies and this might even be better than the sink organization project we did together! 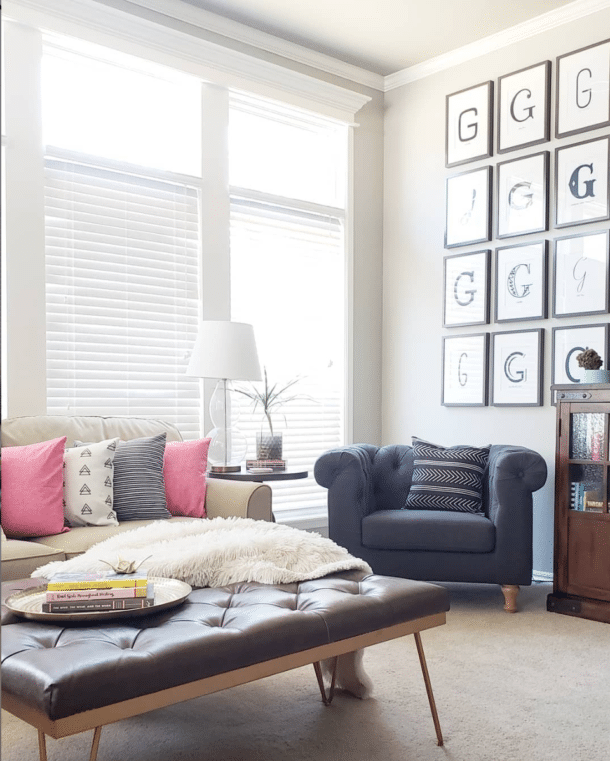 This post is in partnership with Interdesign, but all selections and ideas are my own. Post also contains affiliate links and I may receive a small commission if you purchase items from this post. 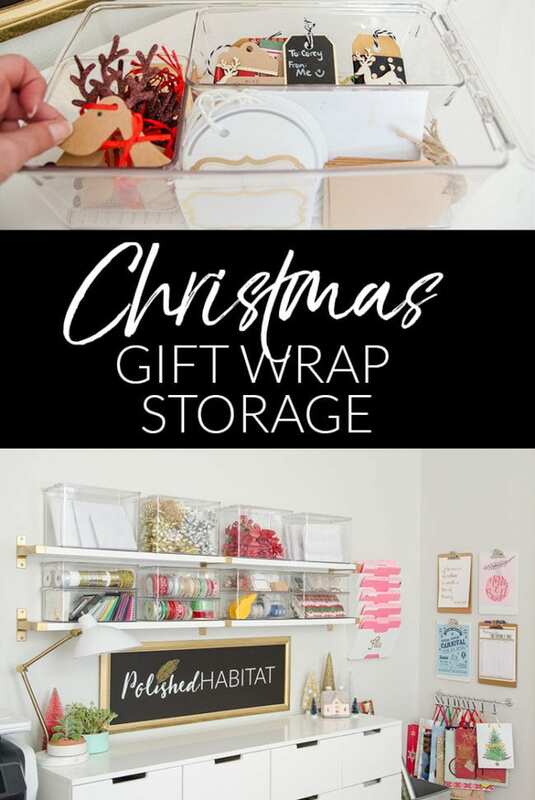 I started with clear, lidded storage bins in 3 different sizes for everything except wrapping paper and bags. The transparent design makes it SO easy to find exactly what we need. To keep smaller items separated, I used Interdesign kitchen drawer organizers inside some of the containers. It’s a tight fit, but one extra-small and one small work without interfering with the lid. Since the containers have lids and are stackable, you could store them anywhere. PS: These would be AMAZING for toy storage as well. 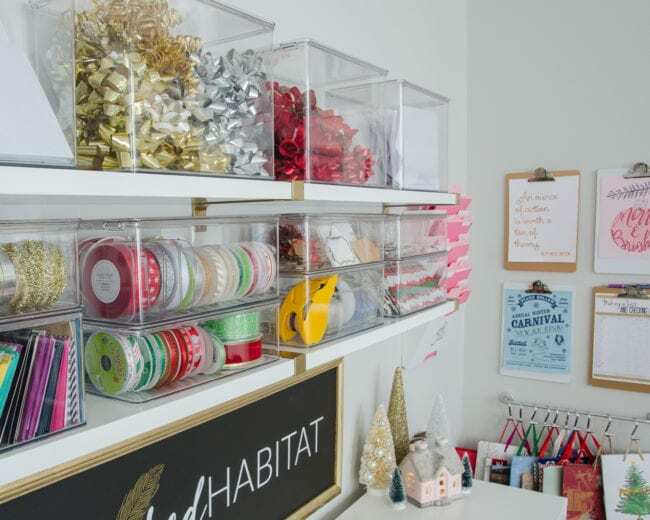 I opted to temporarily take over the shelves in my office and create my dream wrapping zone! Consider commandeering your own floating shelves for Christmas, or pack up books from a few shelves of a bookcase for the month. 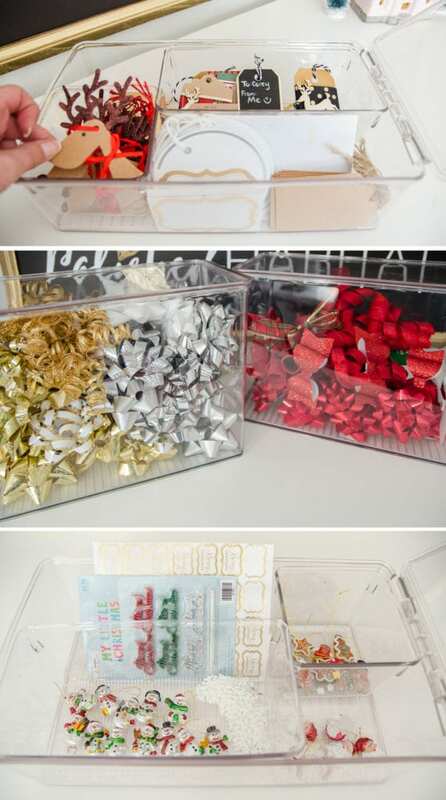 It will be so worth it to have an organized way to wrap gifts as you bring them home. 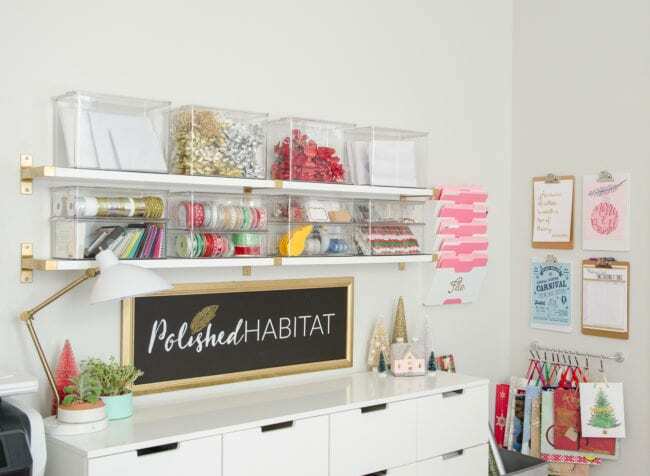 Wondering how I worked wrapping paper and gift bags into this space? 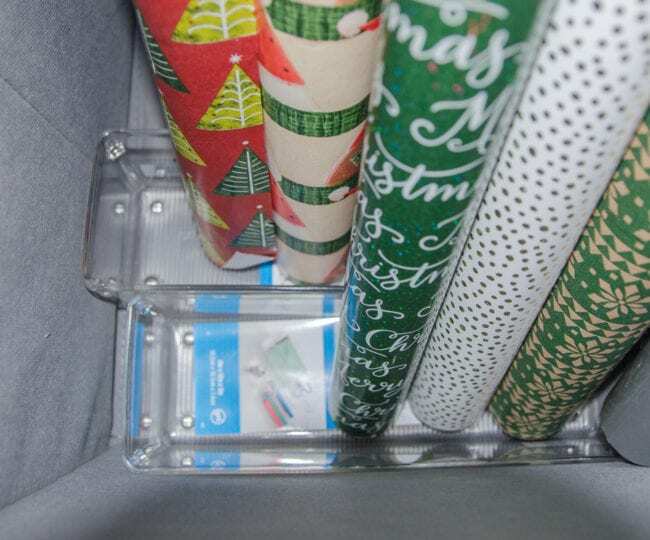 I used a square hamper for gift wrap, with one little trick to keep things neat. When I put all the wrapping paper in the hamper, it wasn’t fully cooperating. There was a mini-avalanche each time I tried to remove a roll. To help the rolls stay straight, I used two drawer organizers in the bottom. I had the organizers on hand, and they worked perfectly. However, since you can’t see them, this may be a good spot to try and save a little cash by testing something like cracker boxes. You just need something slightly wider than your thickest roll. 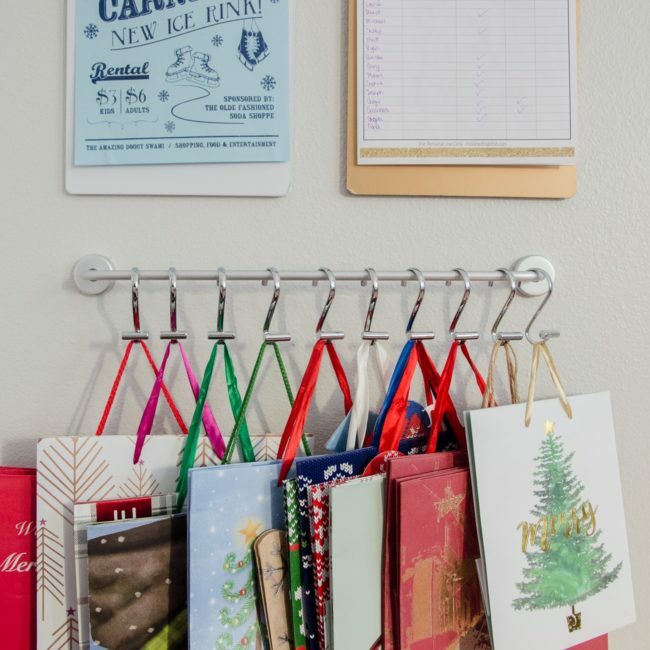 Did you catch the sneak peek of the gift bag storage above? It might be my favorite! We installed a towel bar and used these Interdesign shower curtain hooks! The T-bar in the front means you can put several bags on one hook without worrying about the bags coming off when you slide them on the rail. Ready to see how it all looks together? It took all my willpower to resist labeling those beautiful bins. I can see everything in them, so it wasn’t necessary for function. And this time of year, I need to practice saying no to things so I have more time to enjoy the Christmas season. Last year, I was pretty upset when we didn’t get the majority of the presents wrapped until the 23rd. It was such a short time of being able to enjoy them all under the tree. Plus, the night of the 23rd, we were frantically working on wrapping instead of enjoying hot cocoa and a Christmas movie. Now, as we finish up shopping this weekend, we can wrap without hauling out random boxes of paper and supplies each night. And anything that reduces stress in December is a great idea! If you haven’t seen the rest of the office, you can find it here! If you also need help keeping track of your gift-buying, make sure you head to my printable gift-tracker next! This is fabulous, friend! I’m totally snatching up some of those bins for my closets. You will LOVE them. SO sturdy and they stack so well. I can think of about a million other places I want to use them now. This looks so organized! I have a good work table in the corner of my den, just waiting for “holiday chaos prevention” duty. (If I don’t do something proactive, wraps will be drug out by those in the family who shall be nameless, and cause chaos in the house. I don’t need anymore chaos right now!) I had not thought of bringing out a subset of the wrapping materials and setting it up for general, temporary use. Thanks! And you have blown my mind with the spinach container suggestion. I’m almost embarrassed that I’ve never thought to reuse those! 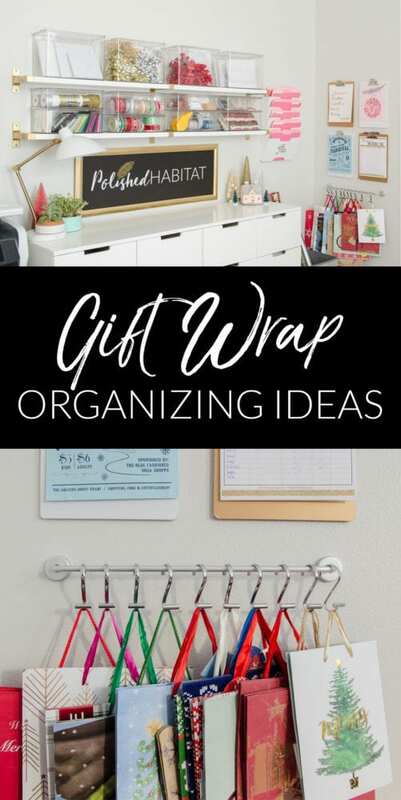 They are a perfect way to stretch an organizing budget. Thank you so much for sharing. I’m all for implementing whatever solutions work with a budget right away and then upgrading to more permanent solutions over time if needed/wanted. I can especially see using them wherever I need to compartmentalize something I’m accessing frequently, where the heavier duty bin will not end up breaking. I put my “homemade laundry detergent supplies” all in one of them in the laundry cabinet, and I have really enjoyed taking that bin down the past 2 months, and enjoyed putting it away just as much. It’s all self-contained with its own place on the shelf! For that tiny moment, I feel organized, lol. Oh, I love it when Aldi has the cheap organizing containers! 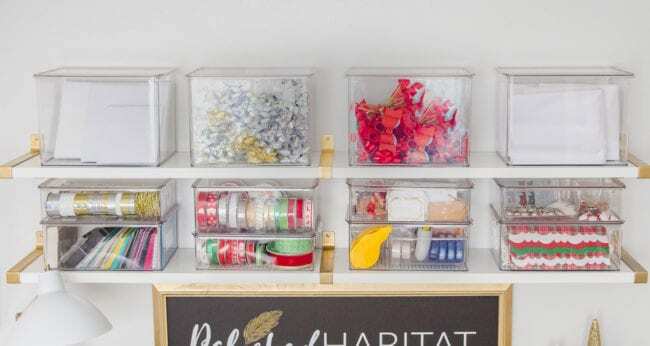 Mixing them in so you can get the sturdier Interdesign bins in more frequently used spots in the perfect budget strategy. And nothing feels better around the house (you know, other than family), than when you feel totally organized at whatever task you are doing in that moment. It always motivates me to be more disciplined in everything I do! Yes, and then various people — again who shall be nameless, lol, including moi — go into that closet and either try to help, which is sometimes worse, or just try to access stuff, or dump stuff in on top because “there’s never time”. Add in my own stash and dash. Ha! YES! I always want to blame the closet piles on my husband until I realize many of things on the tops of piles are mine. 🙂 I hear you with the clutter on clutter too. 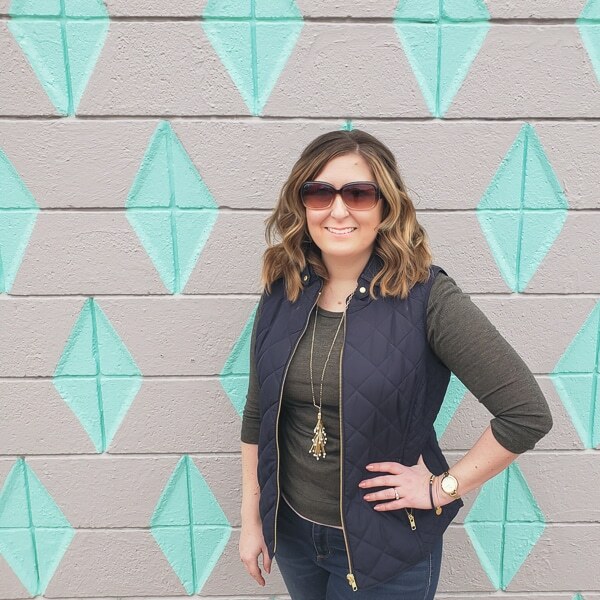 I LOVE Christmas and all the festive decor, but by the 27th, I’m ready for it to disappear and love the fresh feeling the house has with all the Christmas decor packed away. Don’t even get me started on those fabulous InterDesign bins !! 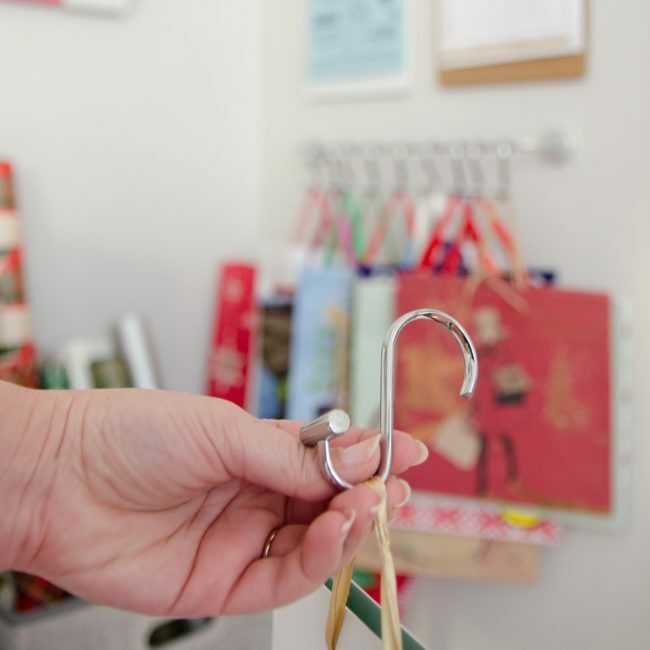 They are a life-saver when it comes to storage and organizing. Even if the size you order is not quite as expected, I always find an alternative use/place for them. I agree! I always end up finding a million places to use them!